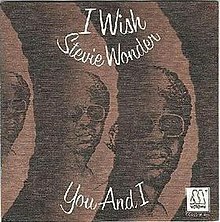 "I Wish" is a hit song by Stevie Wonder. It was released in 1976 as a single and included on the album Songs in the Key of Life. Written and produced by Wonder, the song focuses on his childhood from the 1950s into the early 1960s. The single hit number one on the Billboard Hot 100 and soul singles chart. For the television series Classic Albums, Wonder recreated a small section from the song to demonstrate how he composed and arranged it. He played the keyboards and drums himself, and used most of the musicians that recorded the original. Will Smith sampled "I Wish" for his 1999 hit "Wild Wild West". The song is heavily referenced in Happy Feet and Animal Kingdom: Let's Go Ape. The song is used in the opening of Cheaper by the Dozen 2. ^ John McFerrin. "Stevie Wonder- Songs In The Key of Life". Retrieved 2018-09-22. ^ Whitburn, Joel (2004). Top R&B/Hip-Hop Singles: 1942-2004. Record Research. p. 636. ^ Wonder, Stevie; Beus de Jung; Nick de Grunwald (1977). "Documentary: The Making of Songs in the Key of Life pt. 8". Video documentary of the making of Songs in the Key of Life. Isis Production. Retrieved 16 May 2010. ^ "Stevie Wonder - I Wish - dutchcharts.nl". dutchcharts.nl. Retrieved 12 September 2018. ^ "Will Smith feat. Dru Hill and Kool Moe Dee's Wild Wild West sample of Stevie Wonder's I Wish". whosampled.com. Retrieved 30 July 2014. This page was last edited on 26 March 2019, at 08:45 (UTC).